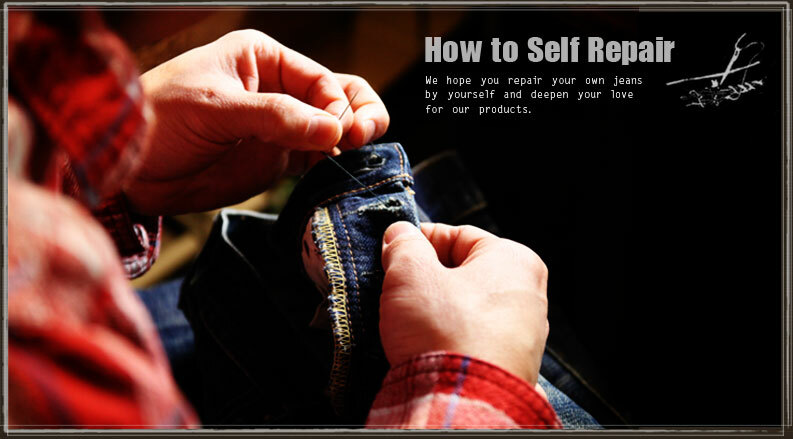 To repair the pair of jeans is good chance that you love your denim more and more. If the damage is light, mending is easy. Why don’t you challenge it? 1. Remove strings from snag stitches. 2. Prepare string in same color and do backstitch. ・Not only damage parts but also normal parts. This prevents to come untied. 1. Put the patch on your denim and mark around the hole on it with marker. If fabric became thinner. you need large patch to cover the thinner part. Ragged T shirt is best for it. Any cloth which is thin and tough is ok.
2. Cut the cloth 1cm bigger than you marked for to keep turn back. 3. Fold back the edge of the patch and press it. 4. Turn your jeans inside out. Fix the patch with dress pins. Do running stitch inside the 5mm from outline of patch. To cover the repair mark. make back side stich longer than front side. 5. Turn your jeans back. Do running stiches inside the hole for 5mm away. 1. Sew edge of the button hole. If your denim fades color a lot. grey string is the best for the repair. 4. Turn the jeans inside out, patch with dress pins and sew upper, left and right side by sewing machine. Bottom side doesn’t need to be sewed. 5. 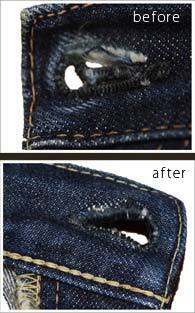 Turn back the jeans and sew vertically over the hole several times.